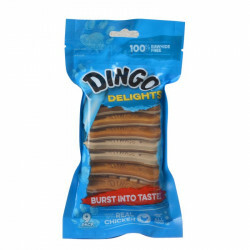 Dingo Delights Dog Treats with Bacon & Cheese are 100% rawhide free, double-sided snacks made with real chicken! 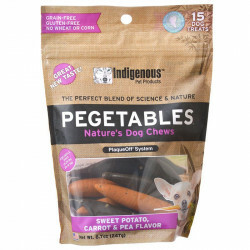 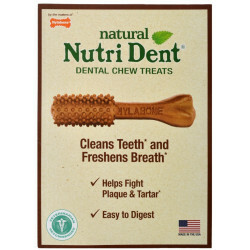 One side features a tough dental chew that helps reduce tartar and massage gums, and the other has a delicious chicken treat to reward your dog's good behavior. 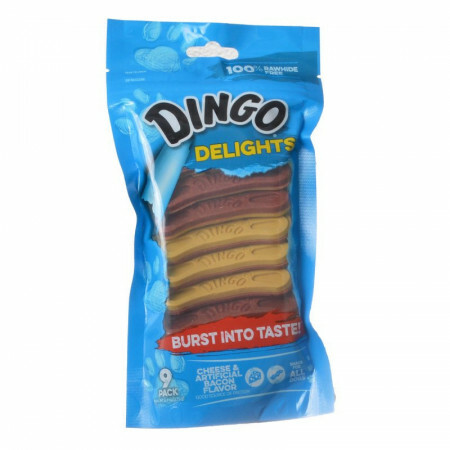 Formerly Dingo Doubles 2 in 1 Dog Treats - now with no rawhide! Ingredients: Wheat Gluten, Glycerin, Glutinous Rice Flour, Modified Starch, Pineapple Fiber, Gelatin, Natural Chicken Liver Flavor, Cheddar Cheese, Palm Oil, Calcium Carbonate, Natural Smoked Bacon Flavor, Fructooligosaccharide, Titanium Dioxide (color), Sodium Propionate (preservative), food grade colorings (FD&C Yellow #6, FD&C Red #40, FD&C Yellow #5, FD&C Blue #1), Bromelain Enzymes, Alpha-tocopheryl Acetate.